If you’re not familiar with NewGuy, I don’t blame you. I’ve only made one other NewGuy post. This series is meant to document my sampling of all sorts of motor-related activities and aims to prove that you don’t need to invest thousands of dollars just to try out something new with cars. I left a note with my name and number stuck to that Datsun’s window via an extra Roadkill sticker I had from the rally I did a month earlier. Turns out we both work for Oakland University’s housing department, so we met later that day during training. A week goes by and now I’ve met handful of his car friends. Driving home from class one night I find myself thinking of all these enthusiasts at my school that I never knew were right under my nose and I have the idea to start a Facebook page for all the car guys at my school. After pulling in my driveway, I check my phone and see I have an invite to a group called “Cars of OU”. My new friend Shane had the same idea and beat me to it. Here’s a photo of Shane’s GTO for no good reason besides I love that blue. The page started with about five of us. We’d post a picture of our car(s) and introduce ourselves and our vehicles and as friends of friends joined the page they’d do the same. We wanted to grow this community. How do we reach car enthusiasts on and around campus with little connections and no budget? We had to get creative. We did that 500 cards for ten bucks deal online and got some cards that had our name and an invitation to join our Facebook page on them. Since it was summer at the time, we would drive around all the parking lots (OU is a commuter school) and put cards on any car we guessed was owned by an enthusiast. The other group admins and I spent our time between classes cruising the lots and putting cards on all sorts of cool cars. The response was quick and positive. We grew from about 25 members to 100 in a week’s time. New members would excitedly join and post their car with the card, happy to be recognized by others in a hobby that usually makes little sense to most people. The business cards had more effect than we anticipated, as people who got carded would then take that card and put it on other enthusiast cars they saw parked at school. The cards are still circulating months later. This ten dollar investment proved to have limitless potential! These went on for a few weeks along with conversation on the group’s page, and eventually someone introduced the idea of becoming an official Oakland University club. We all agreed this would be a great idea because clubs are funded, but we’d have to make some changes to the group to be more appealing to the school. The club was growing and now that we were looking at becoming official, we needed a clear direction. We came up with a bit of a mission statement, along with a new name. We wanted to build a community of enthusiasts for the people that all share the passion regardless of make, model, number of wheels, cylinders, or liters of displacement. We aimed to reach those who lived too far north of the Woodward scene to participate and accepted people who attended Oakland or lived/worked in the surrounding area. A name change to Oakland Motors Club helped insure motorcycle and truck owners felt just as welcome. Scale was something that is important for becoming official at Oakland University. They want their clubs to be able pull respectable attendance numbers at their events. We wanted to prove that we could do this and so as the newly named Events Coordinator of the club, I planned our first car meet. I foolishly set the meet for 8am on a Sunday because I didn’t want it to conflict with anyone’s plans. I regretted that the moment my alarm went off. Fall was in full swing and it was chilly, but that didn’t stop me from driving the buggy. I rolled in a little after 8 with a box of 120 doughnuts on the roof rack and was surprised to see a number of people had gotten there early. Car guys are a special kind of devoted. 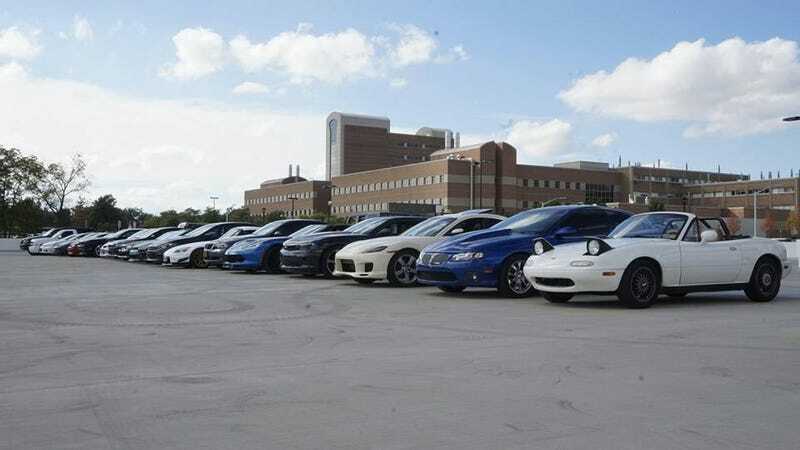 With a bunch of modified and loud cars showing up to a parking structure on a Sunday morning, we were worried the campus police may think a Fast & Furious Race Wars was going on and shut us down. We emailed them and asked permission to have the event; they definitely didn’t say yes, but they didn’t explicitly say no. So we took that as a yes. Everyone knows young car enthusiasts get a bad rap, but this was just silly. After a brief meeting with the lady in charge we got everything cleared up. We’re now an official Oakland University club and have access to a budget to throw events and raise money for charity! We decided to take a special focus on veteran’s charities. Oh yeah and they made us change our name from Oakland Motors Club to Motors Club of Oakland University. Whatever. A small price to pay, if you ask me. Looking ahead I have so many plans for this club that will tie in neatly with NewGuy. From karting days, to attending stage rallies, to cruises and charity fundraisers...there’s a lot in store. We currently have 285 members on the online page along with quality activity and conversation every day, despite it being winter. Starting a car club has proved to be a great way to meet dozens of quality friends and make connections that introduced me to parts of car culture I didn’t think I had access to. That was how I did it, you should do it too.